This post is sponsored by Radisson RED. Although spring is about a month away, winter is still a harsh reality here on the East Coast. True, we haven’t gotten much snow, apart from one big snow storm that we had recently. But that didn’t make winter any easier on this hot Brazilian body! ??? The truth is I love the looks of winter but hate being super cold. Mildly chilly, like in the Fall, is okay! Teeth chattering cold? Not so much. Lola on the other hand, is an Siberian husky living in an English cocker spaniel body. She LOVES the snow! But since my tropical self can’t keep up with her outdoorsy personality, I’ve put together a list of some fun activities that I like to do with her during the cold season. 1) Go on a vacation or getaway! Yep, I just had to start with the best one. Because nothing beats a fun trip, amirite? But how is that even possible, you might be asking yourself. Finding a pet friendly hotel is one of those impossible tasks, right there with finding pet friendly apartments in NYC. Well, Radisson RED hotels are the answer to your prayers! They will be waiting for you and your furry child with a dog kit that includes from a Fatboy Doggie Lounge to a cool bandana, so both of you can relax in style and comfort. 2) Snuggle by the fire. 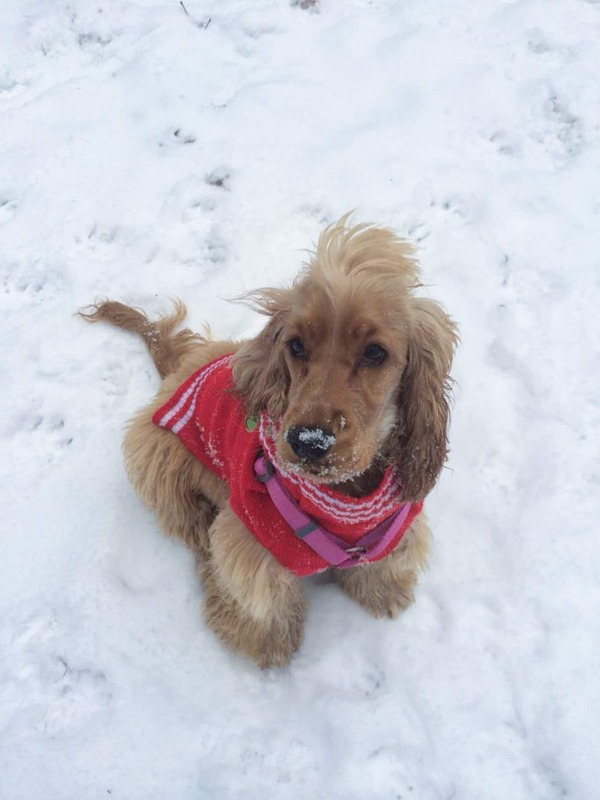 Just because it’s winter, doesn’t mean you can let your pooch look less than its best. Oh, how am I kidding? As you can see in some of the pictures in this post, Lola was a mess this winter. Shame on us for letting it get that far! Thankfully, our wonderful groomer Biviana was able to give her a makeover and have her looking like the dog model she deserves to be! 4) Make homemade dog treats. What do you do when it snows and your human kids are home? You bake, right? So why can’t your dog join in the fun? Here’s some ideas from Pinch of Yum and The Kitchn. 5) Go on a indoor play date (or dog party)! Life is much better when you have good friends! Lola’s best friend (ahem, boyfriend <- don’t tell her dad!) Ludwig turned 1 this year and we had a blast at a play date/birthday party. Surprisingly, they behaved quite well and didn’t destroy our friend’s apartment, proving that dogs can have lots of fun indoors! 6) Teach your dog new tricks. Dogs need to be constantly stimulated. Lola loves to perform her tricks in exchange for delicious treats! We practice them daily and she’s very good at them. However, we are guilty of sticking with what we already know and haven’t taught her anything new in a while. With so many helpful Youtube tutorials out there, there is no excuse for us not to have her learn a new trick at least once a month! After all, it is fun quality time that you and your furry get to spend together. 7) Play in the snow! Go ahead and get outside! Life is too short to be afraid of a little cold and dirty. Okay, if your dog is anything like Lola, you will end up with a very wet and dirty dog. But who cares? Nothing beats the look of happiness on the face of a snow loving dog. Besides, you can always take her/him to that much needed grooming session mentioned above right after the snow fun. Or, if you’re up to the challenge, bathe her/him at home! Ha. Good luck with that! ? I hope you got inspired to spend some quality time with your dog this winter. You do not need to get upside down to entertain them! All they need is a little love and attention. Believe me, we humans need those things as well and a pooch’s love is irreplaceable! P.S. Don’t forget to enter Radisson RED’s contest so you can win a stylish dog bed!